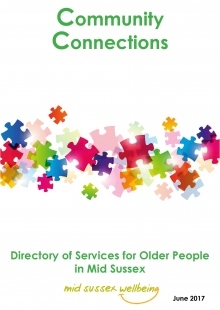 The Community Connection Directory of Services for older People in Mid Sussex has been developed in partnership with organisations working with, and for, older people in Mid Sussex. The aim of the directory is to provide information about organisations which are here to help and forms part of the Mid Sussex Wellbeing Service. Mid Sussex Wellbeing is a 'one stop shop' for information and signposting to health and wellbeing services in Mid Sussex. The team includes trained Wellbeing Advisors who can provide advice and guidance about leading a healthy lifestyle and staying well.